2017 Edition - What are you baking? Started a new fermented fruit friendship bread jar at the end of 2016 (old one I had been using for 23 years burned in the fire). So it is about time to make cakes and cupcakes with the fruit, drown the cake a bit with some juice, and pass some juice on. My husband hates these "chainmail letters you eat". He disliked how I dragged the juice around with me from different states and houses LOL. But alas, there will be another! He absolutely loves eating them, though! I made a honey-orange cake today, for my master gardener group's monthly meeting on Tuesday (I'll be out most of tomorrow and I read that honey cake keeps well). I've been coveting this beautiful honeycomb cake pan since I saw a cake made with one at a beekeeping class last winter (the classes went for six hours and lunch was provided) and finally bought it last week. Below is the recipe I used. I replaced the whiskey with Grand Marnier, added a tablespoon of orange zest and brushed on a glaze of honey and orange juice. Used honey from our hives. Forgot to take a pic after glazing (it's covered and resting in the sunroom now and I don't want to hobble downstairs - arthritic knee is acting up). I'll try to remember to take one later. Even after putting some of the batter in separate dishes (quality control for DH, you know ), it rose at least an inch above the edge of the pan, so it had a huge muffin top I trimmed that off and turned it out and I was so excited that it came out of the pan easily and in one piece! Can't wait to serve it. Such delicious pictures, y'all! I keep forgetting to get pictures! The first half of the friendship cake was primo, hoping to make the other half of the batch in a couple weeks to share. So happy to have a new starter! Nice-looking cake, GG. What is it with knees today? More than once I had to stop walking up the steps so my trick knee could catch up with me! I have two OTC knee braces - if I'm like this tomorrow, I'm going to strap them on. Oat cookies with raisin and my tummy didnt like it.. 'sigh* I cant even eat cookies any more. I am getting this pop up and it won't go away. I hit all the options including the X. I had to force a restart of the browser because it froze up. I wonder why it's happening. I am having fun with my new grain free muffin recipe. I first made it with raspberries which it called for. Then I used fresh blueberries. Today it will be cranberries! I used coconut oil, milk and sugar but doesn't taste like coconut at all. You can actually do a lot of subs to make it as "free" or "not" as you want! I made marmalade for the first time the other day and DH said it would be great with English muffins. I've been meaning to make this recipe, so that was a good nudge I haven't cut into it yet, but it smelled great while it was baking. Baked it in my Pampered Chef stoneware loaf pan. I love that recipe! I use if for my breakfast stratas. It's amazing how close it tastes like English Muffins. 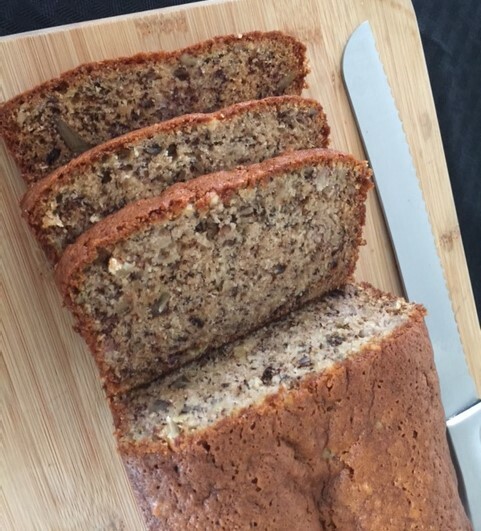 Here's Flour's Famous Banana Bread. It's a staple in the Smokey household.